Friday kicked off the biggest blizzard of the year. (That would be more impressive if it weren’t just the first week in January.) It was cold and windy and snowy. Wind chill in the negative digits. Our city had a parking ban. And the weatherman on TV made it clear that any child who so much as thought about sledding would immediately be stricken with frost bite. Bottom line: We. Were. Stuck. Inside. But before I describe how my husband and I braved the storm (by which I mean, a full day inside the house with two small children who had already spent a tremendous amount of time inside during the holiday break), let me back up for a moment. And tell you about Thursday. The day before the storm. The day to prepare. For me, this meant a frenzied last minute trip to the grocery store. As usual, it was packed. 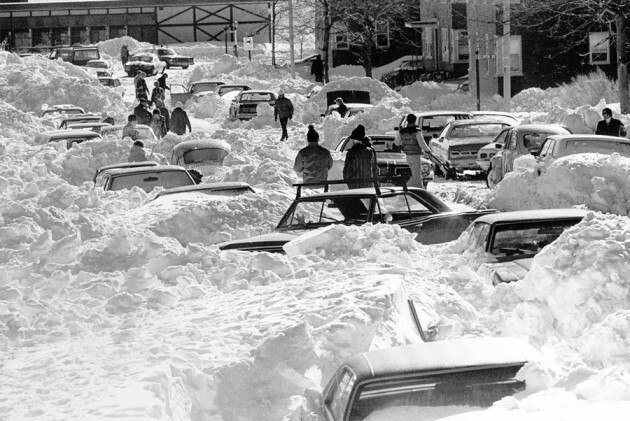 Because around here, whenever snow is forecast, people have flashbacks to the Blizzard of 1978. The Big One. The one that no one saw coming. The one that made people abandon their cars on the highway. The one that left people stranded at work or housebound for days. (The one that produced a bumper crop of “blizzard babies” nine months later.) Because of that blizzard nearly FORTY YEARS AGO, every snowflake sends the locals stampeding to the grocery store for two items: milk and bread. People buy milk and bread with abandon. Even people who are completely lactose and gluten intolerant. Seriously. At this point it’s just habit. Or maybe even tradition. Anyway, there I was in line at the grocery store behind people with carts full of bread and milk. And I had just one item: ice cream. Did this make me feel a bit uneasy? Absolutely. I couldn’t help worrying about all the poor yahoos all around me who were going to wake up the next morning, shut in by the storm, without even a pint of ice cream in their freezer. Poor bastards. Anyway, once home (with the ice cream safely snuggled in my freezer) I turned to my husband, Dan, and asked him The Question. You know the one. “Are you going to work tomorrow?” This was short hand for: “Will you be working (albeit from home) or helping me take care of our one-year-old, Emma, who is fighting a nasty head cold and our four-year-old Jacob who has been needing a bit of extra attention lately . . . ?” Well . . . ? Dan may have a different version of what happened next. But I’m SURE you will see (by virtue of the fact that you will only read my side of the story) that I am correct. Dan CLEARLY STATED, “I guess I’ll take the day off. But I have a work call at 12:30 and 3:00pm.” No problem. I can work with that. Happy to do business with you, sir. Friday, 6:00am. Jacob was the first to wake up. We knew this because, as his parents, we are tuned in to his subtle rhythms. By which I mean that he threw back his head and let out a rebel yell (“MOOOOMMMMY!”) like the bloody house was on fire. Dan sprinted down the hall to shush Jacob before he woke up the baby. I stumbled my way down soon after. Despite the urgency in Jacob’s voice, he had no intention of actually getting up. (GAH.) So, Dan slipped back to our bedroom. And I sat on the edge of Jacob’s bed for twenty minutes while he rolled around and luxuriated in the comfort of his blankets, pillow, and stuffed animals. Which begs the question: WHY. WAS. I. THERE?? 7:00am. Everyone was downstairs eating breakfast. The snow was piling up outside. 7:20am. I went upstairs to use the exercise machine for a few minutes and then shower. 8:15am. I traded off with Dan so he could shower. Jacob got involved in an art project. Emma dug her little hands into some playdoh. Everyone was happy. For the moment. Do you mean the work that you have CLEARLY INDICATED THAT YOU WERE NOT GOING TO DO TODAY WHILE WE BOTH TAKE CARE OF THE CHILDREN? Because if I knew you were going to work today, I would have . . . done stuff. Made plans. Thought of a more elaborate art project to keep Jacob occupied. Cut random stuff into shapes to glue down. On some other random stuff. Found some long forgotten toys in the basement to play with. I WOULD HAVE PREPARED FOR THIS. What about that loaf of bread you said you would bake with Jacob? And the apple chips you were going to make together? FOR THE LOVE OF G-D, MAN, YOU PROMISED HIM APPLE CHIPS. 9:01am. Dan explained that he simply couldn’t have said he would take the day off because he had work to do. Ahh. Well that clears it up. I FEEL OODLES BETTER NOW THAT WE HAVE A LOGICAL EXPLANATION FOR THIS MISUNDERSTANDING. He then went upstairs to work. 9:02 to 10:14am. Jacob and Emma played with or rejected every toy we own. Emma found at least three new uses for the glue stick. 10:15am. The father of a little girl that Jacob plays with called to see if we wanted to have a play date. Yes. Yes (SWEET G-D OF REDEMPTION) we do. An aside: I have noticed that natural disasters– by which I mean blizzards during which my husband is not available to help with the children– bring out my religious side. Hmm. 10:16am. The little girl and her father were at our front door. They arrived in the only vehicle on the road that was not being pulled by sled dogs. 10:20am. Everyone was playing happily. For the moment. 11:30am. Jacob and the little girl started bickering like an old married couple. Jacob was peeved that the girl was STILL looking at a book that he wanted. The book was called “Forever Friends”. I talked with Jacob about the concept of waiting for his turn. Though honestly, it seemed like a far better opportunity to talk about the concept of irony. (Opportunities lost.) Meanwhile, the little girl stoked the flames of Jacob’s discontent. “We don’t always get what we want,” she said, without looking up from the book. Jacob shrieked. 12:10pm. The playdate was over. Dan made a brief appearance downstairs for lunch. 12:30pm. Dan disappeared upstairs again to work. Jacob watched a short video. Emma started rubbing her eyes. 12:50pm. Emma was asleep in her crib. For a good solid 45 minutes. Seriously? That’s it?!? I’ve YAWNED for longer than that. Lordy. Hello, Afternoon with Two Tired and Cranky Kids. Jacob (deep sigh): I don’t know. Me: Seeing all the snow outside? Jacob. No . . . Keep guessing. Me: Reading stories? Your friend coming over to play? Having a tuna melt for lunch? Me: Watching people shovel snow outside. So, there it is, folks. After all the tap dancing I did to keep Jacob from dismantling the house out of sheer boredom and/or curiosity, the highlight of my son’s day was: Looking. Out. The. Window. And then, in typical Jacob, non sequitur fashion, just before his last goodnight kiss, he asked this. Jacob: Mommy, why do we eat chicken? Me: Because it has protein. And it tastes pretty good. Jacob: But Mommy, chickens are in danger! Me: You mean endangered? I don’t think so. Who said that chickens were endangered? Jacob (eyeroll): I just did.